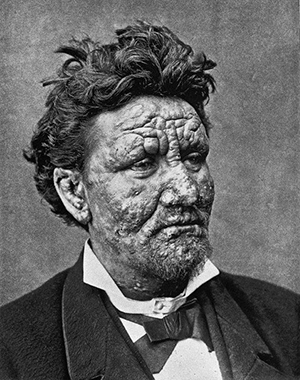 In the late 1860s, on the basis of his clinical and anatomical studies, Norwegian physician Gerhard Armauer Hansen (1841-1912) concluded preliminarily that leprosy was a distinct disease with a specific cause, and not simply a degenerative condition with multiple potential etiologies. (See Figures 1 and 2.) His subsequent epidemiological studies in Norway found no association between the occurrence of leprosy in various districts and general mortality rates, provided evidence that leprosy was contagious rather than hereditary, and demonstrated that isolation of cases produced a decline in incidence. Figure 1. Gerhard Armaner Hansen. Photograph by J.F. Lehman, Munich, 1912. Public domain. Courtesy of the U.S. National Library of Medicine. Hansen tried unsuccessfully to stain his preparations. 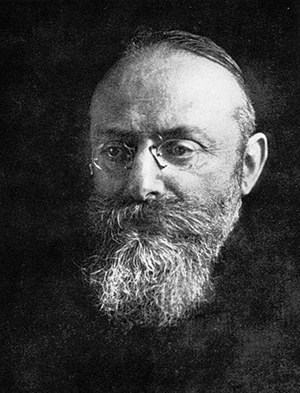 In 1879, when Hansen was visited by Albert Neisser (1855-1916), a young colleague from the laboratory of German physician and pioneering microbiologist Robert Koch (1843-1910) in Breslau, Hansen, encouraged him to try to stain the bacteria. (See Figure 3.) 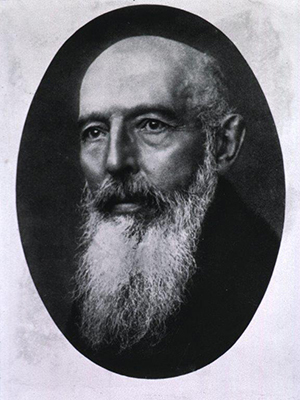 Shortly after Neisser returned to Breslau, he succeeded in staining the bacteria, and then promptly announced his findings, suggested that these bacteria were indeed the infectious agent of leprosy, and claimed priority for the discovery. Figure 3. Albert Neisser. Public domain. Courtesy of the U.S. National Library of Medicine. Figure 4. Left: Hansen’s drawing (1880) of “brown elements colored with methyl violet, from a tubercle treated with osmic acid.” From Hansen (1880). 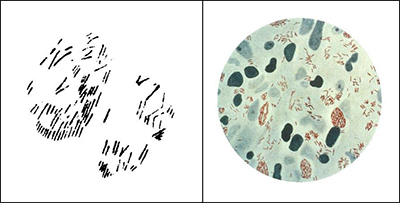 Right: A photomicrograph of Mycobacterium Leprae (small red rods), taken from a leprosy skin lesion. Public domain. Courtesy of the U.S. Centers for Disease Control and Prevention, Public Health Image Library (PHIL) #2123. After being isolated and grown in pure culture in an artificial medium, it can induce the disease in an experimental host. These criteria were later augmented by Koch and subsequently known as the Henle-Koch postulates. Neither Hansen nor Neisser demonstrated that the bacteria observed in cases of leprosy were specific to that disease, nor was Hansen able to transmit the disease to animals or humans using leprous material from patients. Hence, at the time of the Hansen-Neisser controversy, it remained unproven that leprosy is infectious, despite even an unethical attempt by Hansen to transmit leprosy to a patient without informed consent. Furthermore, to this day Mycobacterium Leprae has not been grown in pure culture in an artificial medium. Evans AS. Causation and Disease: The Henle-Koch Postulates Revisited. Yale J.
Fite GL, Wade HW. The Contribution of Neisser to the Establishment of the Hansen Bacillus as the Etiologic Agent of Leprosy and the So-called Hansen-Neisser Controversy. Int J Lepr. 1955;23:418-428. Hansen GA. Spedalskhedens Arsager (causes of leprosy). Translation by Pierre Pallamary. Intl J Leprosy 1955;23:307-309. Hansen GA. On the Etiology of Leprosy. Br Foreign Medico-chirurgical Rev 1875;55:459-489. Hansen A. The Bacillus of Leprosy. Q J Microscopical Sci 1880;20:92-102. Hansen GA, Looft C. Leprosy: In Its Clinical & Pathological Aspects. Translated by Norman Walker. Bristol: John Wright & Co., 1895. Irgens LM. The Discovery of Mycobacteriom Leprae: A Medical Achievement in the Light of Evolving Scientific Meathods. Am J Dermatopathol 1984;6(4):337-343. Vogelsang TM. The Hansen-Neisser Controversy, 1879-1880. Int J Lepr. 1963;31:74-80. 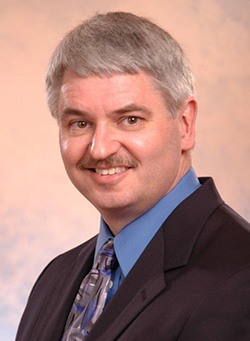 Peter J Koehler is the editor of this history column. 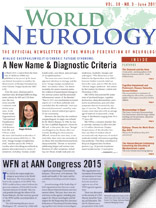 He is neurologist at Atrium Medical Centre, Heerlen, The Netherlands. Visit his website at www.neurohistory.nl.